Green Party Candidate for Philadelphia Sheriff Cheri Honkala spoke at 200 Church before a group of approximately 50 students on Monday night. She discussed her background as a protester as well as her hopes for the Green Party. As a formerly homeless single mother, Honkala said that she believed it necessary to act against the widespread poverty present in America. She has worked for 25 years as both a protester and protest organizer to combat this problem. Honkala has been involved in several major protests and has been arrested over 200 times, while also founding the Kensington Welfare Rights Union and writing a “take-over handbook” for protesters. During the lecture, Honkala spoke at length about several protests she was involved in, particularly a protest in Harrisburg, PA. In 1996, she helped lead 60 families on a seven-day march from Philadelphia to Harrisburg, where they demanded to speak with then-Governor Tom Ridge about the problem of homelessness within Pennsylvania. Honkala went on to describe how afterward, she and her fellow protesters proceeded to camp out in the Harrisburg Capitol rotunda for several days. Honkala also mentioned several other protests she had been involved in, including protests at both the 2000 and 2008 Republican National Conventions. 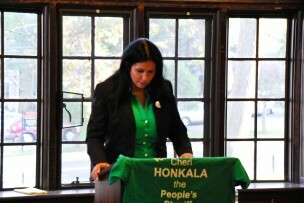 Despite her history of civil disobedience and condemnation of politicians, Honkala was still dedicated to running for office as a member of the Green Party. On Feb. 17, she announced her decision to run in an effort to help the growing homeless population in Philadelphia. Honkala is running as the “people’s sheriff” and has vowed to represent the people of Philadelphia in a way she feels that previous sheriffs have failed. If elected, she plans to address the foreclosure issue in Philadelphia by not enforcing evictions and helping residents remain in their homes. Given that she is running as a third party candidate in a two party system, many people might be skeptical about Honkala’s chances. Despite this, she believes she has a good chance at winning. Many members of the Green Party have been extremely enthusiastic about Honkala’s decision to run for office. Two Green Party Officials also attended her lecture. The lecture also marked the founding of the Wesleyan College Greens by Ross Levin ’15, who volunteered on Honkala’s campaign this summer and organized the lecture. At the lecture, over 35 students expressed interest in joining the group. Some students who attended the lecture drew connections between Honkala’s experiences and the ongoing Occupy Wall Street protest. “I thought that she made a really good point about how, as people are occupying financial districts across the country, there are also thousands of people struggling simply to occupy their homes under the threat of eviction,” said Jeremy Keim-Shenk ’12. Levin was pleased with Honkala’s lecture and the unique views she represents.